Threats, intimidation, property damage, burglary - the details of a tenant's claims of being terrorized in the Hoboken Housing Authority for not supporting Executive Director Carmelo Garcia's Vision 20/20 plan are exploding on Grafix Avenger today. GA who broke the growing story of a tenant who doesn't believe Vision 20/20 is what it's being pitched as by Garcia, finds herself under duress receiving a letter on HHA letterhead from its legal counsel Charles Daglian accusing her of being behind a second leafleting of flyers. The same tenant who is about to go public according to at least one reliable source, claims to being asked to sign her own eviction notice the previous day for distributing flyers. In the letter, Daglian calls the tenant's alleged distributing of flyers "libelous" and orders her to cease and desist from doing so in the future and if the tenant is not responsible they should "advise" the HHA "of that fact." It's not clear under what legal authority Daglian is acting on as housing authority tenants have the same First Amendment rights as other US citizens and no evidence is offered of the alleged activity. Daglian has been the center of controversy for a year where five attempts to renew his contract have failed or been rejected as "legally flawed" by HUD. Carmelo Garcia has insisted the appointment be approved and promised recently in comments to Hoboken Patch, Daglian would be his recommendation a sixth time after a bidding process was again completed. Grafix Avenger has both recent flyers in question, Daglian's accusation is connected to the flyer the tenant apparently had nothing to do with according to the story. 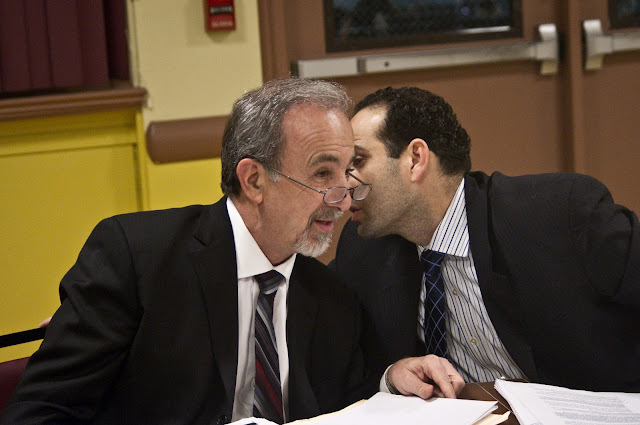 HHA legal counsel Charles Daglian (l) and Carmelo Garcia confer at an HHA meeting earlier this year. The controversy around them, Vision 20/20 and a HHA tenant who claims being terrorized is exploding on GA.
Talking Ed Note: MSV understands the HHA tenant is taking action, about to go public and taken complaints to law enforcement and other agencies. Neither Charles Daglian nor Carmelo Garcia were contacted for this story. They are invited to do so publicly submitting comment to smartyones@me.com.